The aim of this panel discussion was to discuss how ICANN Org, the Universal Acceptance Steering Group (UASG), and the ICANN community can work together to achieve the strategic goal of developing unique identification systems to continue serving the needs of the global Internet user base. Improve understanding and responsiveness to new technologies and standards through greater involvement with industry, academia, standards development organizations and other relevant stakeholders (even if technology and standards are discussed by us). The session started with a welcome note from Christian Dawson and then an introduction of the panelists by Lars Steffen, further Mr Ram Mohan (former UASG Chair) was called upon to answer the question: Who is the UASG and what has it achieved so far? IDNs for each of the SO / AC. After the panelists had their chances, Panel Discussion took place on various topics which were followed by an Open Discussion i.e. including the attendees as well. The Internet is used by more than half of the world’s population. It is expected that the vast majority of new Internet users will come from Asia and Africa. As it evolves to include more of the world, the next chapter in the growth of the Internet will increasingly impact the global Internet community. With an exponential growth forecast, the number of Internet-connected devices is increasing even more rapidly. ICANN must play a role in ensuring that a single, stable, interoperable infrastructure, including the provision of IANA functions, addresses the needs of both users and devices. In order to reach a more diverse Internet user base, it is necessary to promote and improve universal acceptance and the implementation of Internationalized Domain Names (IDNs). Furthermore, embracing the rapid development of emerging technologies, business and security models enables ICANN to maintain agility as the Internet evolves. Thus the strategies discussed will ensure that ICANN enhances the unique identification systems of the Internet to better serve a broader and more diverse global user base and protect an open Internet for all. 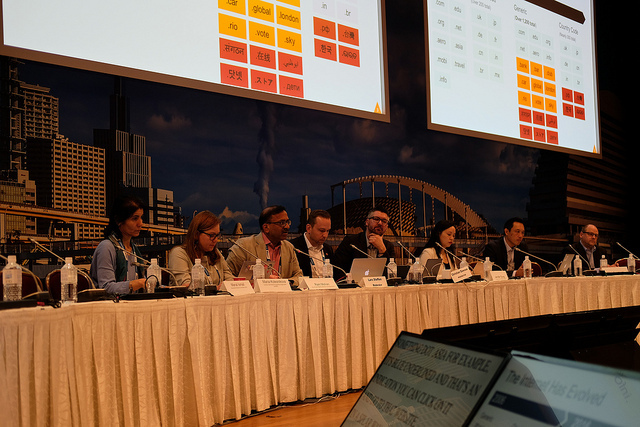 Moderators wrapped up the session after a healthy discussion and this session was definitely the highlight of the final day in ICANN64, Kobe Japan.